First day page 7: Seventh stop, Simantadwip, Sri Khazi Samadhi. The stone samadhi of Chand Khazi has two trees growing out of it. A champaka tree and a neem tree. 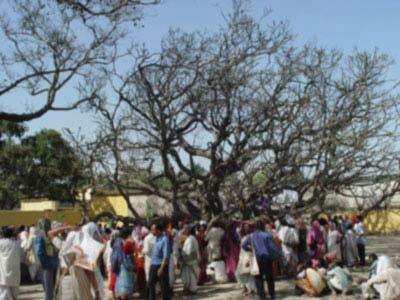 The champaka tree is said to be over 500 years old and to have witnessed the events of Chand Khazi with Sri Chaitanya Mahaprabhu. Having narrated this story, Nityananda Prabhu took Jiva Goswami with Him and quickly entered Khazi Nagar. There He told Jiva Goswami: "O Jiva, listen carefully. Khazi Nagar is none other than Mathura. Here, after performing kirttan, Chaitanya Mahaprabhu delivered the Khazi, the Muslim Mayor of Nabadwip, and bestowed upon him the jewel of Love of Godhead. In his previous life the Chand Khazi of Nabadwip had been the cruel King Kamsa of Mathura. In the same way that Kamsa was Krishna's uncle, the Khazi was Sri Chaitanya's uncle. "After the Khazi stopped the chanting of Hare Krishna and broke the mrdanga drum, everyone took shelter of Sri Chaitanya, fearing the Khazi's wrath. The Khazi was under orders from Hussein Shah, the Muslim King of Bengal. In his former life the Shah had been the demonic Jarasandha in Krishna's Pastimes. The Lord, in His half-man, half-lion form of Nrsimha, struck fear into the heart of the Khazi just as cruel King Kamsa had been struck with fear, knowing that Krishna would kill him. The Khazi was filled with terror beholding the power of the Lord. Instead of killing him, however, as Krishna killed Kamsa, Sri Chaitanya Mahaprabhu bestowed Divine Love of Godhead upon the Khazi, who became the best of devotees. Whoever hears this story of the Khazi's deliverance is most fortunate." Nityananda Prabhu concluded, "Just see the difference between Vrindavan and Nabadwip: those who offended Krishna in Vrindavan attained impersonal liberation, merging into the Lord's effulgence, whereas those who commit offenses in Nabadwip achieve the treasure of Love of Godhead. Because they are filled with mercy, the Pastimes of Sri Chaitanya Mahaprabhu may therefore be considered the highest expression of divinity. The Holy Name, abode, form, and qualities of Sri Chaitanya are so merciful that they do not consider any offenses. As long as any offenses remain within a devotee's heart, the Holy Name and abode of Krishna will deliver him only after a long time. On the other hand, simply by chanting the Holy Name of Sri Chaitanya and by visiting the holy land of Sri Chaitanya, one quickly attains Divine Love. Offenses are no obstacle, because here in Nabadwip a devotee can conquer over them very easily. O Jiva, one who visits this place and sees the samadhi of the Khazi will soon be released from the pains of material existence."